Now in its 102nd edition, this legendary bicycle race is set to kick off in Utrecht and will once again captivate spectators all around the world. The event gets massive media coverage in the Netherlands with nightly television updates, live coverage and endless analysis. Brandon Hartley has the lowdown, to make sure you can impress your Dutch friends, colleagues and relations with your Tour de France expertise. The first Tour de France was organised in 1903 by a fledgling French sporting magazine called L’Auto. Desperate to find a way to boost their readership, the publishers held an emergency meeting. That’s when Géo Lefèvre, one of the magazine’s youngest reporters, suggested they host a bicycle race. Not just any bicycle race though. The original plan was for the event to take place between May 31 and July 5. The gruelling concept scared away many competitive cyclists. When only 15 of them signed up, the organisers cut the race down to a far more reasonable (but still incredibly challenging) 19 days and slashed the entry fee in half. The infamous Lance Armstrong isn’t the only participant to find himself embroiled in a huge scandal. The Italian-born cyclist Maurice Garin won the first Tour de France but his racing career was later dogged by controversy and disgrace. Garin agreed to participate in a second Tour in 1904 but he and several other racers were accused of cheating. Despite being the first cyclist to cross the finish line that year, he later had his title stripped. What exactly did Garin do? Specific details have been lost to the ages but, among other things, he supposedly accepted a bit of food during a stage of the race when doing so was forbidden. From its outset, the Tour de France has captivated crowds and tempers have often flared among cyclists and fans alike. Emotions ran so hot during the first race that the organisers (prematurely) decided that the 1904 follow-up would be the final Tour. Despite efforts to make spectators and participants behave themselves, there were numerous incidents of violence. Garin found himself in a brawl involving fans and another cyclist outside of Saint-Étienne and remarked ‘I’ll win…provided I’m not murdered before we get to Paris’. When cyclist Antoine Fauré buzzed through his hometown, 200 of his followers began attacking the racers behind him. Another spectator later tossed nails out into the street to pop the tires of a few competitors he was rooting against. If that wasn’t enough, several cyclists were also accused of using cars to pull them up the course’s toughest hills. Despite being an almost complete disaster, the race returned for a third edition in 1905 and has since become one of the most popular annual sporting events on the planet. It’s been held every year since 1903, with the exception of 1915-1918 and 1940-1946 (due to World War 1 and 2). The 2015 edition’s Grand Départ will take place in Utrecht. However, this isn’t the first time the Tour has kicked off in the Netherlands. The 1954 race started in Amsterdam and was the first one to begin outside of France. Day 1 led racers from the city’s Olympic Stadium along a 216-kilometre course to Brasschaat. Ten Dutch cyclists participated in the race and one named Wout Wagtmans won the first stage (but French racer Louison Bobet eventually won the top prize). It was Bobet’s second of three consecutive Tour wins. As of this year, the Tour de France has begun in the Netherlands six times. In addition to Amsterdam in 1954, the 1973 race began in Scheveningen. 1978’s Tour began in Leiden, ‘s-Hertogenbosch nabbed the honour in 1996, Rotterdam hosted in 2010 and Utrecht in 2015 makes six. Vincenzo Nibali, the cyclist who won the 2014 Tour, could win this year’s edition too. The Italian racer was born near the Strait of Messina and this fact, in addition to his competitive nature, has earned him the nickname ‘The Shark of the Strait’. Others prefer to call him ‘Nibbles’. Other favourites include British racer Chris Froome, Italy’s Alberto Contador and Nairo Quintana from Colombia. 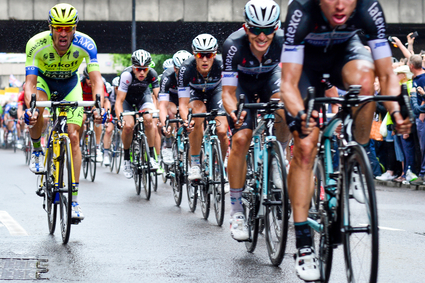 The 2015 Tour will lead cyclists over a 3,300+-kilometre course and will be comprised of a total of 21 stages. The first two will happen in the Netherlands. In addition to the Grand Départ in Utrecht on 4 July, the second stage the following day will run from Utrecht to Neeltje Jans, a small island in Zeeland. You can learn more about the events that will take place in the Netherlands here. The city of Utrecht put in an initial bid to host a Grand Départ back in 2002. After eventually agreeing to host the 2015 one, local officials and other organisations gradually invested an estimated €15m in the event. In addition to a €4m fee that went directly to ASO, the group that oversees events including the Tour de France and the Dakar Rally, Utrecht invested additional revenue in removing speed bumps and traffic islands from roads and hiring security. Other requirements put forth by the ASO: ensuring that there’s a ‘no fly zone’ over Utrecht during the race and freeing up 2,000 parking spaces for organisers and members of the press. But what does Utrecht stand to gain from all of this? While many have criticised the cost of the Grand Départ, proponents are eager to point out that the attention and economic boost the city will receive from the event is worth all of this effort. Estimates suggest that between 500,000 and 800,000 racing fans will flood into town between July 1 and 5 (which is sure to increase everything from beer sales in neighbourhood cafes to overnight stays in local hotels). Looking down the road, the Grand Départ could help boost tourism in the long run and enhance Utrecht’s reputation and overall image worldwide. The Tour attracts an annual television viewership of around 3.5 billion people so that means a lot of eyes will be on the city this weekend.